The men are having a good time,grey is the color of the fall,but is it that cold there already,that you have to wear coats and all.The red shoes on the other guy tells me that he doesn´t take fashion too seriously. how amazing is this picture..way to capture the essence of these two men together. and arent those red shoes just the jazziest thing on that man..how fantastic! 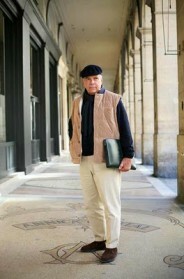 a man at the age that still has that “something” in his style..love it love it love it. also most definitiely digging the jacket on the man to the left. Tonchi just looks soo cool in that leather bomber jacket and the slicked back, black hair. I hope I age that way. I bought a navy suede jkt (very similiar to Mr. Tonchi’s) in Milan and thought i would not wear it for months but I broke it out one night for dinner in Paris and it was the perfect weight. 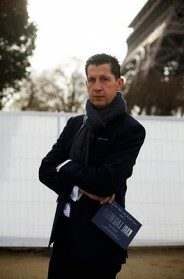 I love the look of the black leather jacket and cravat/neckerchief on Mr. Tonchi. Well played sir. Oh I love that second photo. 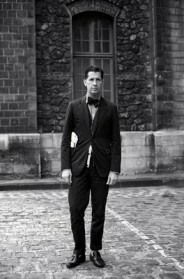 BTW, since it’s the 1st time I post here : thanks Mr Sartorialist for this inspiring blog + pictures! My mister gets annoyed when we’re too matchy matchy like them–I like it. It’s cute and my mister is cute when he gets annoyed by little things. the buttons on the leather bomber are a nice little twist — one expects to see a zipper. i don’t think i will ever tire of the color gray. it flatters everyone and always looks so current, regardless of the color of the moment. in fact, i can’t wait for it to go “out” again so i can feel happy about wearing it. Terry’s boots are from Church’s on sale, or so he said. I love em. He has a v good eye. loooove love love the red shoes! I think this is one of my favourite Sartorialist shots, simply because it is so carefree and at ease… this is what life is about! Also, it seems Paris and London are sharing the unfortunate weather–it was actually hailing on Oxford Street today! And who says tassel loafers aren’t cool?! I really like the polka dot scarf under Mr. Tonchi’s sweater. it looks like little spots of red are all the rage for men these days. the spots and the red and the grey and the smiles…delicious and delightful! Love the tassel loafers! Tassel loafers are very cool. Are those red suede shoes??.. amazing!! I love the leather jacket and gray (scarf?) on Tonchi.. and I really don’t like gray but I really appreciate it on them..
Everybody lookes great and very stylish with the ever timeless smile….. Someone decided Mr. Tonchi doesn’t take fashion seriously because he wears those red shoes? Oops, I guess I meant Mr. Schaefer. Holy cow that 2nd photo is amazing! Aside from the fact that they look like an uber-dapper Laurel&Hardy, I like the fact that they’re rocking “Autumn” colors with hints of summer. Yeah, well, the red shoes are less hint and more holler but you get the idea. I think the comment about red shoes indicating that he doesn’t take fashion (or himself) too seriously was meant as a compliment. Schaefer has a definite sense of whimsy and fun. LOVE the second photo: what a great shot of these two! Dunno if i like the leather jacket in itself but, outfits looks nice. I love the cardigan on the older gentleman. It looks great on him. I think the shoes are too “and I’ll just add a splash of color!” …. too premeditated … it’s okay if yr outfit IS premeditated, but it shouldn’t LOOK premeditated. they both look great – but those red shoes are an absolute scene stealer. Mr. Tonchi and Mr. Schaefer are style setters, the leather bomber, the red shoes,the cardigan, the driving cap – so confident and the way I would like to dress. Well done! How now looking they are – the hat is perfection. Whose is it? Any idea where Mr. Schaefer got it? Would love to know. Ditto the shoes. These guys rock. Este hombre de zapatos rojos tiene un estilo bárbaro. Da igual lo que se ponga. El estilo no se consigue. Se nace con el y lo lleva puesto. Me encantaría conocerlo en persona. M.